Day of rest. Went to church as usual. We had talks on the Atonement in the Sacrament meeting. Then a lesson on the remaining part of Abinadi's testimony in Sunday School, and a lesson on Elder Holland's talk Laborer's in the Vineyard. A.M. Ran alone. Did a slightly modified version of my Tue/Thu workout. 5x400 down with 100 recovery with the times in the 72.6 - 74.0 range. Then long rest, and 600 in 1:41.9. Then got home and did 6x100 hill sprints starting at 18.2 and ending at 17.2. Then ran with the kids. Benjamin's neck was still not allowing him to run, Jenny, Julia, and Joseph did 2, Jacob did 1, William 0.3. I did a tempo pickup for 0.6. Total of 13.5 for me. P.M. 1 with Benjamin. He tried running with a neck brace and it worked somewhat. I had a thought that he should try running a little faster, and it seemed to help - his form loosened up at least and he looked more normal. A.M. Ran with Ariel. Paced him through a 2.5 mile time trial down the canyon. The target was 6:00 pace, so 15:00. He did 5:58, 6:00, and 2:56 for the last half - total of 14:54. This time he did not need very much "Da me cinco", and was able to focus on his own and maintain contact. This is great improvement for him. When he was 23 he ran the half in 1:09. He is 49 now. Physiologically there should be a 1:15 half in him still, or at least 1:18. But the problem is that when its been so long you forget how to run fast for a long time and start thinking of 6:00 as a sprint, 7:00 as 5 K pace, etc. Perhaps the reason why someone who used to be fast can return to being fast much easier than someone who has never experienced is that he expects a faster pace to be normal, and does not think of it as something outrageous. The same idea helped me learn Spanish - being fluent in English and in Russian I was just expecting to be able to say whatever I needed to and understand everything said to me regardless of the language, and when that ability was not there it bothered me enough that I would do what it took to fix the problem, while perhaps if I just expected Spanish to be a foreign language I would have just given up and never bothered to learn. Got home ran with the kids. Benjamin did 2, Jenny, Julia, and Joseph 2, Jacob 1, William 0.3. Visiting cousins ran various distances. Total of 12.5 for me. A.M. Ran with Jeremy and Ariel. Did a workout. 5x400 with 100 recovery starting at 74.0 and finishing at 71.4 down the canyon. Held together better that on Tuesday - kept speeding up in spite of short recoveries. Then a long recovery, and 600 in 1:40.1. Ariel did the first 200, Jeremy did the first 300. The splits were 34 and 51. Then I was able to speed up closing the last 300 in 49. I was happy about that. Then 6x100 uphill at the house. I did the first three in 18.0, 18.2, 17.7 and felt like I had put quite a bit of effort into them. Then Joseph came and raced me. He was far behind (around 24 seconds), but just knowing there was somebody behind made me run it in 17.3. Then his cousin Nicholas came. 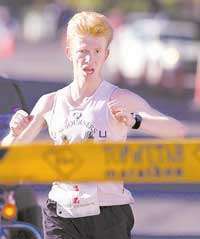 Nicholas is 15, and I knew from running with him that there was a possibility that he could outrun me in 100 meters. With Nicholas racing me, even though he fell behind right away, and I knew he would not be getting faster as the hill got steeper, I ran scared and hit 16.5 - my best time on this stretch so far ever. Nicholas ran 18.7. This was quite remarkable to me. Every single time I do this workout I try to figure out a way to make myself run faster. I try to focus, etc. All of this got me 16.6 twice in the entire history of this workout, and most of the time I do not even break 17.0. A 15 year old kid shows up and runs 2 seconds behind me, and all of a sudden I am able to run 16.5. In the last one, now we had Nicholas and his older brother Zachary. This time I knew that Nicholas could not outrun me, and I also knew that Zachary was not that much faster than Nicholas if at all. I still ran scared because I heard their steps, but I was not as scared as the first time, so I ran 16.8. They got something around 18.5. Ran some more with the kids. Benjamin did 4, Jenny, Julia, and Joseph 2, Jacob 1, William 0.3. Total of 13.5 miles for me. A.M. Ran alone for the first 6. Decided to do a little tempo on the way back. Did almost 3 miles of tempo, the last 3 miles was 17:15, probably would have been around 17:10 had I turned on the engine right away. Then ran with the kids. Benjamin did 6, Jenny and Jacob 1, Julia and Joseph 2, William 0.3. 12.3 total for me. A.M. Total of 15. Did a 6 mile tempo run in the canyon 3 up then 180 and 3 back down. It was an odd run. First mile was good - 5:51, and felt sustainable in spite of the uphill and headwind. Then all of a sudden I had difficulty maintaining the pace in the second mile - 6:16. It did not seem like the uphill got too much steeper or the headwind stronger. HR was stable at around 154-157. I did not understand that. Then I slowed down even more - 6:33. The uphill gets steeper at that point, and the headwind did pick up, but still I think that was too much of a slowdown. Then I turned around, took some time to shift gears, finally got going. Hit the first mile back in 5:35. Then all of a sudden I got a side ache. I do not get them often, in fact, that is the first one I got in three years or so. And it was bad. I had to slow down to 5:50 pace for a while. Next mile was 5:48. With three quarters to go the side ache subsided some and I was able to speed up a little. In the last quarter I had some zip in the legs and ran it in 79. Last mile was 5:43, total time 35:43. Got home ran with the kids. Jenny did 1, Julia and Joseph 2, Jacob 1, Benjamin 6. Benjamin and I ran the last 1.5 of our run in 8:53. Total of 16.6 for me.